Off piste ski courses & lessons with Mark Gear. 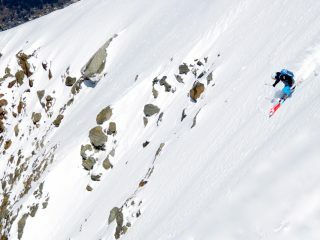 Off piste ski courses in Chamonix for all levels. Learn to ski the whole mountain! Ski Courses for off piste, All mountain & Freeride skiing. Intermediate, off piste ski courses – Courses for learning to ski off piste. Advanced, off piste ski courses – Courses for improving your off piste skiing. Expert, off piste ski courses – Courses with more challenging off piste skiing. Private ski lessons – Get more personal attention. Pre-season ski courses – Early season piste performance courses. 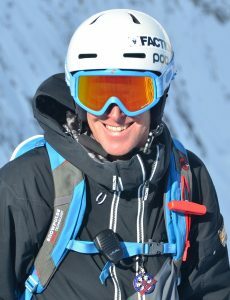 Mark Gear is one of the World’s leading off-piste ski instructors with years of experience teaching all-mountain skiing in Chamonix and across Europe. Mark is qualified to the highest international standard (level 4 ISTD) through BASI (British Association of Snowsport Instructors). He also has the full French “equivalence” (BEES Ier Degré Ski Alpin) having passed the notoriously difficult giant slalom, Eurotest in France. 17 off-piste ski courses are available in Chamonix this winter! Chamonix’s leading provider of instructional, off piste ski courses. Learn to ski the whole mountain with control, versatility & expression! Off piste skiing courses are available for intermediate, advanced and expert level skiers. Our off piste ski courses run all season in Chamonix from early December until late April. The focus of each ski course is to improve your off piste and all mountain skiing. There are 3 course levels to choose from for intermediate, advanced and expert level skiers. Simply check this level finder page to see which ski course is best for you. Video analysis & feedback is included on each ski course. We use effective, daily video analysis and feedback to enhance the training on all ski courses. This is a short and helpful session of around 30 minutes at the end of the day skiing. The video feedback sessions allow you to watch yourself skiing in full HD and in slow motion. This really helps to understand how to develop better skiing. The video analysis sessions are a powerful ski coaching tool to improve skiing performance. Occasionaly bad weather can stop the video sessions. Private transport for skiing is included on all Chamonix based ski courses. Each ski course has it’s own private minibus for the duration of the course. This gives us flexibility to transport to the best skiing conditions available in the whole Mont Blanc area. We aim to ski a variety of the Chamonix ski areas and have the option of skiing some other close by resorts should the skiing conditions be better. Off piste skiing in Chamonix. Read about the off piste skiing terrain Chamonix has to offer. Below is a description of each of the main ski areas that we ski on our off piste courses. 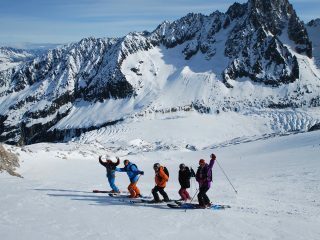 The Chamonix valley offers great variety of terrain and we aim to ski as much exciting off piste terrain as we can during our ski courses. The off piste skiing descents are chosen considering the conditions at the time and the level of the group. Les Grands Montets / Chamonix. Les Grands Montets ski area offers big vertical descents with glaciers on the upper section. 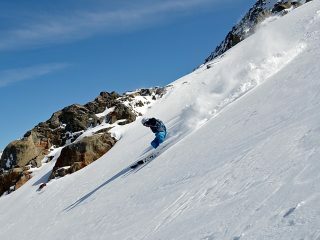 There is plenty of wide, open bowl skiing with some nice steeper sections and couloirs. The tree skiing and in-to valley couloirs are also good for advanced & expert skiers. A great lift system opens up 3 sides to this amazing off piste mountain. Our best spots: Le Grand Muir, Pylones, Point de Vue, Combe de la Pendant, Combe des Rachasse. The Magic Forest (Dream Forest) also offers fantastic off piste skiing in the trees. Le Tour, at the highest end of the Chamonix valley offers great skiing for all levels both on piste and off piste. The front side offer’s easy terrain, ideal for learning off piste skiing. This is an ideal place for us to take intermediate level ski courses on the first couple of days of the course. The back side of the mountain offers very nice off piste terrain for our advanced and expert level courses. Best spots: All the back side and off the Possettes drag lift for some classic Chamonix off piste skiing. A short climb on foot to the top of Tete de Balme provides long backcountry ski runs. Le Brevent and La Flegere / Chamonix. These ski areas are linked and offer very good couloir and open-bowl off piste skiing. Most of the off piste skiing in this part of Chamonix is south facing so avalanches can be frequent on warm afternoons. Best spots: La Floria, Brevent summit, Col Cornu and the Combe de Lachanal all offer fantastic off piste skiing. Les Houches is situated at the lower end of the Chamonix valley and offers nice tree-lined piste skiing and some shorter off piste runs. Best spots: Under the Prarion cables, The hidden meadows and secret off piste spots that only us locals know about. This is a good place to ski when the visability is poor as the forest provides shelter, often with awesome powder skiing in the trees. Just 25 minutes drive from Chamonix, through the Mt Blanc tunnel we arrive in Italy, at one of the Courmayeur cable cars. Courmayeur is included on the Mt Blanc Unlimited lift pass. The ski area has plenty of terrain for all levels of skier offering perfectly groomed pistes, exciting backcountry skiing, fantastic mountain food & powder skiing off piste. How to get to Chamonix. Chamonix is just 1 hour drive from Geneva International airport making it one of the easiest major ski resorts to get to. Many companies fly into Geneva from most major airports. There are also many airport transfer companies offering shared minibus or private transport to Chamonix. 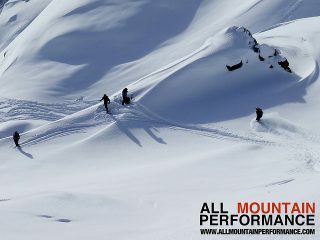 All Mountain Performance – Chamonix’s off-piste and backcountry skiing specialists since 2004.